With its principal station at Toddington in the North Cotswolds a visit to the Gloucestershire & Warwickshire Railway (GWR) is well worth while to the steam rail enthusiast and for visitors who enjoy the nostalgia of travelling by steam train. You can now travel on the train to the Cotswolds village of Broadway in addition to Winchcombe and Cheltenham racecourse. For further information - Gloucestershire Warwickshire Railway. Based at Bitton Station it is mid-way between Bristol and Bath and signed off the A431, once a Midland Railway Station it has been extensively and painstakingly restored from a state of dereliction. The Avon Valley Railway is 6 miles from Bath. For further information - Avon Valley Railway. The Severn Valley line wends its way through beautiful country side with its views of the River Severn from Kidderminster in Worcestershire through to Bridgnorth in Shropshire. The Severn Valley Steam Railway is 15 miles from Worcester. For further information - Severn Valley Railway. 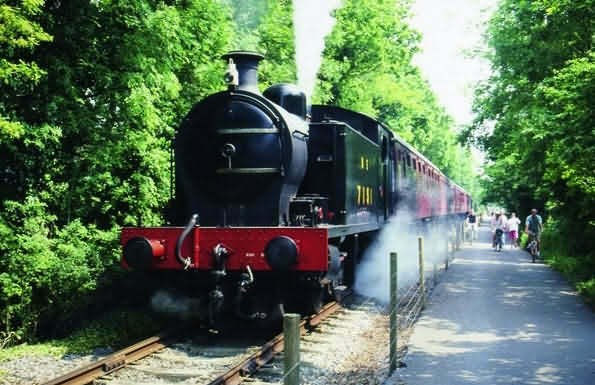 The Dean Forest Railway is run almost entirely by volunteers and is based at Norchard near Lydney in Gloucestershire. It offers visitors the chance to soak up the sight, sounds and smells of travel on a rural branch railway operated by steam trains and the occasional heritage diesel or diesel railcar. The line runs from Lydney Junction to Parkend a distance of some 8 miles. The railway is 20 miles travel distance from Gloucester. For further information - Dean Forest Railway. The Brecon Mountain Railway is a 2' gauge line of 3.5 miles length running through part of the spectacular Brecon Beacons National Park, although perhaps not as rugged as the mountains of Snowdonia this area is rightly known for its natural beauty. Located 3 miles north of Merthyr Tydfil this narrow gauge railway is signposted on the A470 and A465 roads. Travel distance from Bath is 68 miles. The Swindon & Cricklade Railway is one of the few British heritage railways to undertake complete reconstruction without an inheritance of track and buildings from British Rail. It is based at and began operations, in the late 1970s, at Blunsdon railway station (2.7 miles from Cricklade) and has since extended to Hayes Knoll. The rail track length is 0.75 miles with extension work in hand double this. For further information - Swindon & Cricklade Steam Railway.